Though she’s currently brightening up the otherwise dreary Batman V Superman: Dawn Of Justice, Wonder Woman is also gearing up for her first solo feature film. Directed by Patty Jenkins, Wonder Woman will tell the Amazon warrior’s origin story, which screenwriter Jason Fuchs (Pan, which isn’t ominous at all) has borrowed in part from DC’s New 52, insofar as Zeus is established as Diana’s (Gal Gadot) dad. 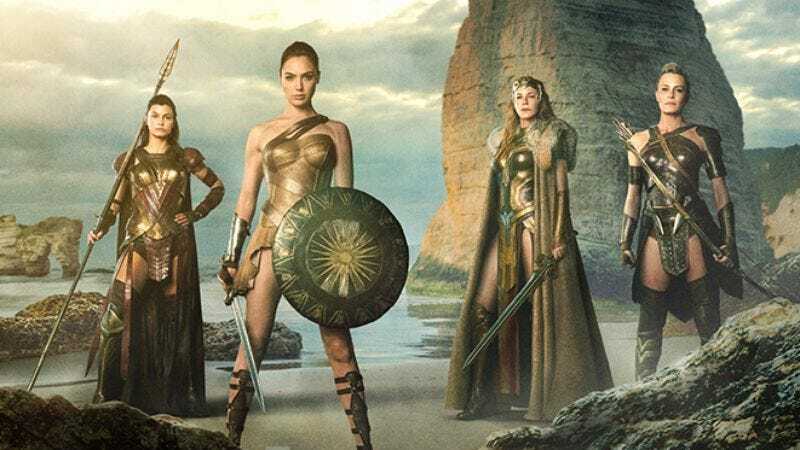 The film’s premiere is still more than a year away, but Entertainment Weekly has shared this exclusive look at Princess Diana’s homeland, Themyscira, as well as her warrior family. We got our first look at the ageless Princess Diana back in January, but EW also offers a glimpse at her mother, Queen Hippolyta (Connie Nielsen), as well as her aunts, General Antiope (Robin Wright) and Lieutenant Menalippe (Force Majeure’s Lisa Loven Kongsli). All four warriors wear armor and carry weapons, though Diana’s the only one with a shield, which is presumably why she earns the moniker of “greatest female warrior” ever. There’s no reason why Jenkins and Wonder Woman can’t have it both ways, but surely the addition of a lasso wouldn’t have weighed her down too much?